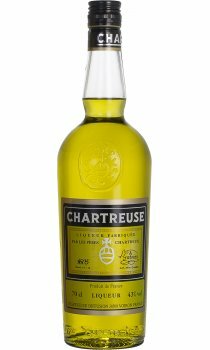 Milder and sweeter than the famous Green Chartreuse, Yellow Chartreuse was introduced to the world in 1838. It also is presented in the traditional Chartreuse liqueur bottle embossed with the seal of La Grande Chartreuse. Its colour is entirely natural with no artificial flavours or preservatives and it too can be enjoyed neat or in a long drink. Another great product. More commonly drink neat, not widely suggested as a cocktail ingredient. Perhaps because of its distinctive flavour. A little sweeter supposedly than Green Charteuse but not noticeably so. Izarra is a good alternative, slightly smoother flavour. But devilishly difficult to find.